One of the true phenomenal acts of their era, The Police bossed the pop charts for most of their career, achieving fame not long after they formed in London in 1977, dressed in combat fatigues and playing a brand of literate, funky pop with jagged, razor wore rhythms that meant they were never going to be part of the punk movement but would be the standard bearers of the new wave. They’ve won six Grammy Awards, two Brit Awards, various MTV video gongs and been inducted into the Rock and Roll Hall of Fame in 2003. Truly a global act, their album Synchronicity sold eight million copies in America alone and their fame spread round the planet, winning fans from France to Russia and New Zealand to Argentina. Thanks to their 2008 reunion tour they were officially recognised as the highest-earning musicians in the world. 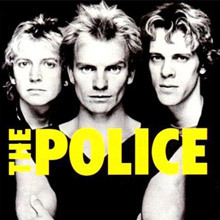 Although they were briefly a quartet until original guitarist Henry Padovani’s fairly amicable departure, it’s as a trio that Sting, Stewart Copeland and Andy Summers turned The Police into a household name. Each one a gifted musician – on bass, drums and guitar respectively – and with all three men having strong opinions, robust personalities and oodles of under the belt dues playing experience they were an unusual proposition by any standards since they straddled what might be termed old school values associated with the early 1970s, combining those with the kind of technical savvy that kept them abreast of a rapidly changing industry. With their bleached blond ‘look’ adding a pin-up scream appeal, The Police were also at the forefront of celebrity culture with Sting a particularly ingenious manipulator of the media in all its forms. The Police were a smart bunch for sure and they didn’t outstay their welcome either. They released five albums in as many years, sold 50 million of them and then went their own ways on solo projects that suited them. They left a timeless body of high-class work. There is no denying the sheer melodic exuberance of their singles and their live shows were always special events. Stewart Copeland was looking for a new project after quitting Curved Air when the American expatriate bumped into Wallsend-born Gordon Sumner, aka Sting on account of a jumper he wore that made him look like a bee. With Padovani they performed in all the usual seedy clubs, building a devoted following that allowed them to release the indie single 'Fall Out' in 1977. When Henry quit (he'd set up the well regarded IRS label) Andy Summers was a strange choice for the guitar seat but an inspired one nevertheless. A 'proper' musician whose CV glittered with time spent playing with Zoot Money, Dantalion's Chariot, Eric Burdon and the Animals, Kevin Ayers, Kevin Coyne, Neil Sedaka and Jon Lord, Summers was obviously somewhat older than his new band mates but the three hit upon a style that allowed each one to shine, achieving a level of harmony that was given extra punch and colour by Sting's unusual vocal range and distinctive high notes. Stewart's brother Miles Copeland who would become the band's legendary manager financed the debut album Outlandos d'Amour. The album was recorded on a shoestring budget and featured the outstanding track Roxanne, that didn't sell well initially but would soon fly when it was re-released in 1979. 'Can't Stand Losing You' amazingly ruffled BBC feathers at the time on account of its picture sleeve but The Police really hit the ground running after they returned from a character shaping US tour and made the outstanding Reggata de Blanc, a reference to their own in-house white reggae styling which was derided in some quarters of the press but adored by increasing legions of fans. In fact they became so popular it's worth recalling there was a kind of Police-mania afoot in 1979 and the singles 'Message in a Bottle' and 'Walking on the Moon' were ubiquitous. Cleverly the Police's first world tour paid special attention to areas of the globe ignored by most rock groups, such as Mexico, Taiwan, Greece and Egypt. Copeland and the band knew that they were mining gold with their music and their appeal became universal. It was a master coup. Zenyatta Mondatta (1980) includes 'Don't Stand So Close to Me' (the biggest selling UK single of the year) and despite the frantic pace of their lives on the rapidly spinning merry-go-round of mega stardom even the harshest critics now fell into line. While they don't yet deviate from their tried and tested sound here you can catch them widening the lyrical net on Sting's 'Driven to Tears' and 'Copeland's Bombs Away. Ghost in the Machine pushed the band further out as they replaced producer Nigel Gray with High Padgham and embarked on one of the first digitally influenced albums, creating a sound that defined the decade for many. Probably most people are familiar with the hits off Ghost - after all 'Every Little Thing She Does Is Magic', 'Invisible Sun' and 'Spirits in the Material World' are virtually pop standards. Now adding horns and synths and through heavy use of keyboards this album marks a significant change in the Police although they retained elements of their adopted Caribbean roots and Summers' enduring love for reggae riffs. This album, inspired by Arthur Koestler and Carl Jung's theory of synchronicity, saw Sting assume a greater control over their direction as he insisted they concentrate on a far more thoughtful approach to arrangement and lyric - meaning the raw trio charm of the original was now a sophisticated beast prepared for the new age. 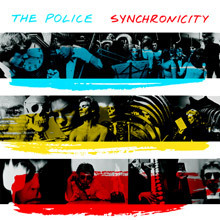 Talking of Synchronicity, that is the Police's fifth and final first phase release. Recorded again in Montserrat and Canada this is their most popular disc. It includes the classic singles 'Wrapped Around Your Finger', 'Synchronicity 11', 'King of Pain' and the immortal 'Every Breath You Take'. So great was its appeal that this was the album which ended Michael Jackson's chart dominance with Thriller in the US and it's frequently cited in respected Great Albums lists, from Pitchfork to Rolling Stone where you won't be surprised to see five stars by the title. It is a masterpiece for sure and went eight times Platinum in America. As befits a band of this stature there are a select number of recommended live discs and well-presented compilations. Live! is interesting because it showcases band concerts from 1979 and 1983, in Boston and Atlanta respectively. The collections such as Every Breath You Take: The Singles, Greatest Hits, The Very Best of Sting & The Police and The 50 Greatest Songs all provide hours of listening pleasure. 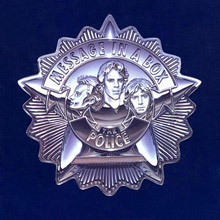 The box set Message in a Box: The Complete Recordings has been hailed as final proof that the Police were a stellar act, the digital remastering of all 78 songs providing a fitting testimony to a group who truly left an indelible mark on rock and pop music with every breath they took. While their subsequent chart-topping albums would contain far more ambitious songwriting and musicianship, the Police's 1978 debut, Outlandos d'Amour (translation: Outlaws of Love) is by far their most direct and straightforward release. Although Sting, Andy Summers, and Stewart Copeland were all superb instrumentalists with jazz backgrounds, it was much easier to get a record contract in late-'70s England if you were a punk/new wave artist, so the band decided to mask their instrumental prowess with a set of strong, adrenaline-charged rock, albeit with a reggae tinge. Some of it may have been simplistic ("Be My Girl-Sally," "Born in the '50s"), but Sting was already an ace songwriter, as evidenced by all-time classics like the good-girl-gone-bad tale of "Roxanne," and a pair of brokenhearted reggae-rock ditties, "Can't Stand Losing You" and "So Lonely." But like all other Police albums, the lesser-known album cuts are often highlights themselves -- the frenzied rockers "Next to You," "Peanuts," and "Truth Hits Everybody," as well as more exotic fare like the groovy album closer "Masoko Tanga" and the lonesome "Hole in My Life." Outlandos d'Amour is unquestionably one of the finest debuts to come out of the '70s punk/new wave movement. 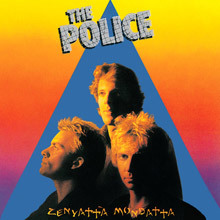 The stage was set for the Police to become one of the biggest acts of the '80s, and the band delivered with the 1980 classic Zenyatta Mondatta. The album proved to be the trio's second straight number one album in the U.K., while peaking at number three in the U.S. Arguably the best Police album, Zenyatta contains perhaps the quintessential new wave anthem, the haunting "Don't Stand So Close to Me," the story of an older teacher lusting after one of his students. While other tracks follow in the same spooky path (their second Grammy-winning instrumental "Behind My Camel" and "Shadows in the Rain"), most of the material is upbeat, such as the carefree U.S./U.K. Top Ten "De Do Do Do, De Da Da Da," "Canary in a Coalmine," and "Man in a Suitcase." Sting includes his first set of politically charged lyrics in "Driven to Tears," "When the World Is Running Down, You Make the Best of What's Still Around," and "Bombs Away," which all observe the declining state of the world. While Sting would later criticize the album as not all it could have been (the band was rushed to complete the album in order to begin another tour), Zenyatta Mondatta remains one of the finest rock albums of all time. 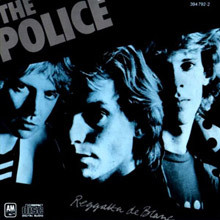 By 1979's Reggatta de Blanc (translation: White Reggae), nonstop touring had sharpened the Police's original blend of reggae-rock to perfection, resulting in breakthrough success. Containing a pair of massive hit singles -- the inspirational anthem "Message in a Bottle" and the spacious "Walking on the Moon" -- the album also signaled a change in the band's sound. Whereas their debut got its point across with raw, energetic performances, Reggatta de Blanc was much more polished production-wise and fully developed from a songwriting standpoint. While vigorous rockers did crop up from time to time ("It's Alright for You," "Deathwish," "No Time This Time," and the Grammy-winning instrumental title track), the material was overall much more sedate than the debut -- "Bring on the Night," "The Bed's Too Big Without You," and "Does Everyone Stare." Also included was one of Stewart Copeland's two lead vocal appearances on a Police album, the witty "On Any Other Day," as well as one of the band's most eerie tracks, "Contact." With Reggatta de Blanc, many picked Sting and company to be the superstar band of the '80s, and the Police would prove them correct on the band's next release. Simultaneously more pop-oriented and experimental than either Ghost in the Machine or Zenyatta Mondatta, Synchronicity made the Police superstars, generating no less than five hit singles. With the exception of "Synchronicity II," which sounds disarmingly like a crappy Billy Idol song, every one of those singles is a classic. "Every Breath You Take" has a seductive, rolling beat masking its maliciousness, "King of Pain" and "Wrapped Around Your Finger" are devilishly infectious new wave singles, and "Tea in the Sahara" is hypnotic in its measured, melancholy choruses. But, like so many other Police albums, these songs are surrounded by utterly inconsequential filler. This time, the group relies heavily on jazzy textures for Sting's songs, which only work on the jumping, marimba-driven "Synchronicity I." 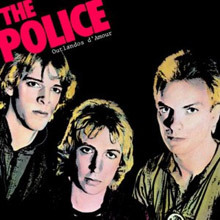 Then, as if to prove that the Police were still a band, there's one song apiece from Stewart Copeland and Andy Summers, both of which are awful, as if they're trying to sabotage the album. Since they arrive on the first side, which is devoid of singles, they do, making the album sound like two EPs: one filled with first-rate pop, and one an exercise in self-indulgence. While the hits are among Sting's best, they also illustrate that he was ready to leave the Police behind for a solo career, which is exactly what he did. 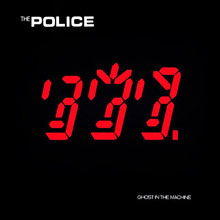 For their fourth album, 1981's Ghost in the Machine, the Police had streamlined their sound to focus more on their pop side and less on their trademark reggae-rock. Their jazz influence had become more prominent, as evidenced by the appearance of saxophones on several tracks. The production has more of a contemporary '80s sound to it (courtesy of Hugh Padgham, who took over for Nigel Gray), and Sting proved once and for all to be a master of the pop songwriting format. The album spawned several hits, such as the energetic "Spirits in the Material World" (notice how the central rhythms are played by synthesizer instead of guitar to mask the reggae connection) and a tribute to those living amid the turmoil and violence in Northern Ireland circa the early '80s, "Invisible Sun." But the best and most renowned of the bunch is undoubtedly the blissful "Every Little Thing She Does Is Magic," which topped the U.K. singles chart and nearly did the same in the U.S. (number three). Unlike the other Police releases, not all of the tracks are stellar ("Hungry for You," "Omegaman"), but the vicious jazz-rocker "Demolition Man," the barely containable "Rehumanize Yourself," and a pair of album-closing ballads ("Secret Journey," "Darkness") proved otherwise. While it was not a pop masterpiece, Ghost in the Machine did serve as an important stepping stone between their more direct early work and their more ambitious latter direction, resulting in the trio's exceptional blockbuster final album, 1983's Synchronicity. 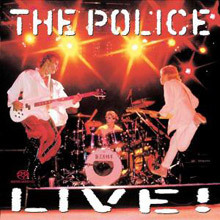 1995 finally saw the release of the Police's long-rumored first official live album, the two-CD Live!. The first CD was recorded back in 1979 in Boston, for an FM broadcast during the tour for their second album, Reggatta de Blanc, while the second disc is from their final tour in 1983 during a tour stop in Atlanta. While the first disc is excellent -- it captures the Police at their most frantic and energetic -- the second disc is pretty darn uninspired (Sting's vocals in particular), as evidenced by the unnecessary and annoying backup singers that are detected throughout. Highlights abound on disc one, including early faves like "Next to You," "So Lonely," "Bring on the Night," "The Bed's Too Big Without You," "Roxanne," "Walking on the Moon," and "Can't Stand Losing You." And while disc two contains a few standouts ("Tea in the Sahara," "Every Breath You Take"), those dastardly backup singers make most of the songs sound like blah lounge versions ("King of Pain," "Synchronicity I," "De Do Do Do, De Da Da Da"). Still, the first disc of Live! makes it a recommended purchase to the serious Police fan. To coincide with their 30th anniversary reunion tour in 2007 the Police released the anthology The Police, the first two-CD retrospective ever assembled on the group. They may not have had a double compilation to their credit, but they had single discs and box sets, which may raise the question of whether they need a set like this -- and the answer is yes, but this set falls just a bit short of being the definitive Policedouble disc. At only 28 tracks, this feels a little too slim. It may be twice as long as 1995's Every Breath You Take: The Classics (and, in a way, that was only 12 tracks, since that contained the 1986 remake of "Don't Stand So Close to Me" and a classic rock mix of "Message in a Bottle," which were little more than padding), but there are a handful of Police staples that are missing, including "Born in the '50s," "The Bed's Too Big Without You," "Shadows in the Rain," and "Rehumanize Yourself," and the heavy emphasis on Synchronicity all but three songs from the LP are present; yes Andy Summers' bizarro "Mother" is one of the tunes missing in action) threatens to overwhelm the second disc. That said Synchronicity does deserve such a heavy exposure, given that it's the band's biggest album, and it's hard to argue with the rest of the selections here since it covers all the familiar hits and most, but not all, of the second-tier classics including "Truth Hits Everybody," "Bring on the Night," "Canary in a Coalmine," "Driven to Tears," and their first single, "Fallout." It may not seem like much, but if those aforementioned four tunes were here The Police would have all the core songs from the trio and this would be truly definitive, but as it stands this collection stands as simply an excellent overview. Despite their legendary status, the Police only released five albums during their brief reign from 1978-1983. In addition, the trio had amassed a healthy amount of both studio and live B-sides, plus songs that only appeared on soundtracks. For the 1993 four-CD box set Message in a Box: The Complete Recordings, every single song the Police ever recorded is included. All the tracks were digitally remastered for the project, sounding superior to the original CD versions of the single albums. Also included is a 68-page booklet that includes an interesting (and often humorous) biography, a time line, and notes from all three bandmembers regarding the rarities that appear for the first time on compact disc here. But of course, the real charm of the box set is the music -- album tracks ("Hole in My Life," "It's Alright for You," "Driven to Tears"), hits ("Message in a Bottle," "Can't Stand Losing You," "Spirits in the Material World"), and rarities ("Fallout," a live version of "Next to You") are all timeless classics. While the set is highly recommended to newcomers just discovering the wonders of the Police, longtime fans should consider replacing their tinny-sounding single CDs with the definitive Message in a Box. After all, it contains a total of 24 tracks unavailable (for the most part) anywhere else. 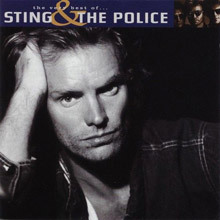 Comprehensive 'Best Of' collection covering both Sting's solo career and his work with The Police. 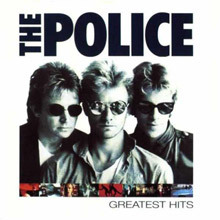 Best Of collection covering all the biggest hits from The Police.